This is Twitter performance writing, in which fiction blends into reality so casually, that it is able to make for compelling narratives. This is a story several years in the making, going back over two years to the series of tweets quoted below. On January 30, 2013, as he headed back home from an all day Department retreat, the got stuck on Dulles airport due to some kind of an emergency, re-encountering the mysterious figure from March 5, 2010. 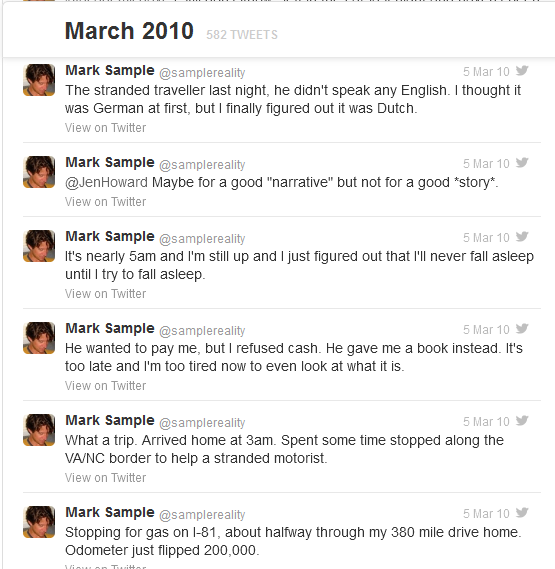 On January 31, 2013 his @samplereality account went 404. Gone. But art abhors a vacuum. And in the absence of this vocal academic— whose idiosyncratic voice reached thousands of followers every day— something emerged to continue telling his story. Or a story. Or is it poetic riffing on his own improvisational self-fashioning? Tomorrow, I will examine the proliferation of accounts based on Mark Sample and discuss some of the strategies at play here.